Peter Watling of Quicklink plans marathon cycle journey. 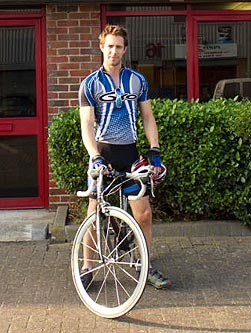 The sales manager at a TV newsgathering solutions provider is to cycle 1,600 kilometres to raise money for the Rory Peck Trust - the organisation that supports freelance cameramen and their families in times of need. Peter Watling from Quicklink will start the journey from John O'Groats in Scotland on May 15th next year and plans to take seven days to reach Land's End in Cornwall. He expects to cover 240 kilometres each day. During the journey he'll be streaming live video from a Quicklink Merlin backpack as well as streaming at set times from his iPhone using the Quicklink iPhone app. If you wish to sponsor Peter, donations can be made via the Quicklink website.